States that saw major coverage gains under Obamacare would suffer the biggest losses under the Senate health care bill, a new report has found. The states that did not expand Medicaid and didn't have many people enrolled in the individual market would feel less of an impact, according to the Urban Institute analysis. The researchers from the left-leaning think tank estimated that a total of 24.7 million more people would be uninsured in 2022, compared to current law. About 57% of the uninsured would be whites, while more than half would have a high school education or less. Also, 72% would be in families with at least one full-time worker. Related: Senate GOP health bill would slash Medicaid. Here's how. Most of the losses would come from the Senate eliminating enhanced federal funding for Medicaid expansion and curtailing federal support for the overall program. Also, the legislation would reduce the generosity of the federal premium tax credits, rending coverage unaffordable for millions. 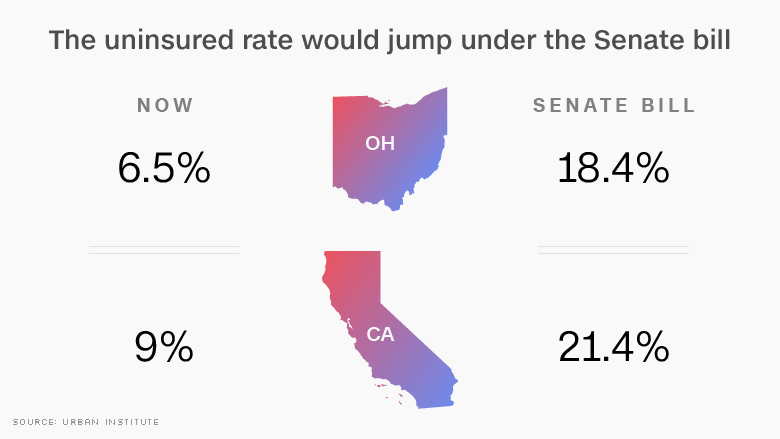 California and Ohio would be among those with the biggest increases in uninsured rates under the Senate health plan. California officials are among the biggest supporters of Obamacare, creating a state exchange and expanding Medicaid. The nation's uninsured rate has fallen to a historic low of 10.4% for non-elderly adults under Obamacare, according to the Centers for Disease Control and Prevention. Ohio Governor John Kasich, a Republican, is among the leading opponents of the effort to repeal Obamacare in Congress. He has repeatedly defended Medicaid expansion, noting it has extended coverage to 700,000 Ohioans and helped many deal with opioid addiction. 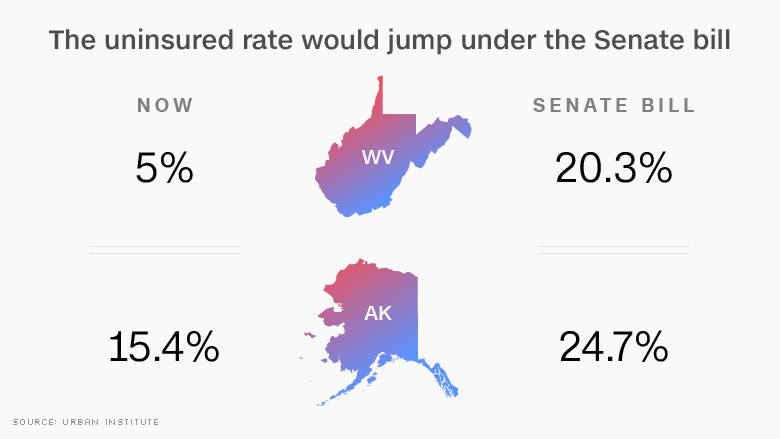 West Virginia and Alaska would also see big reversals, Urban projected. Republican Senators Lisa Murkowski of Alaska and Shelley Moore Capito of West Virginia have also said they would not support their chamber's bill because of the harm it would inflict on their residents. Senate Republicans had hoped to vote on their bill, titled the Better Care Reconciliation Act, this week. But leadership shelved those plans after encountering resistance from multiple senators. 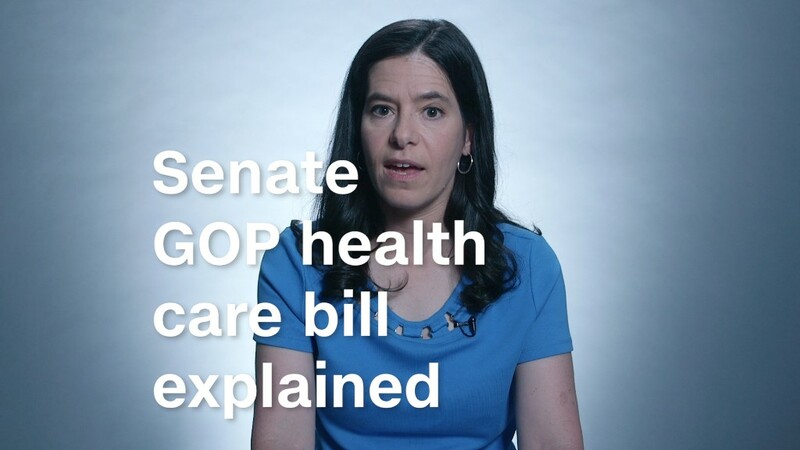 Related: Senate health care plan: What happens now? Majority Leader Mitch McConnell hopes to release a revised bill this week and vote on it by mid-July.